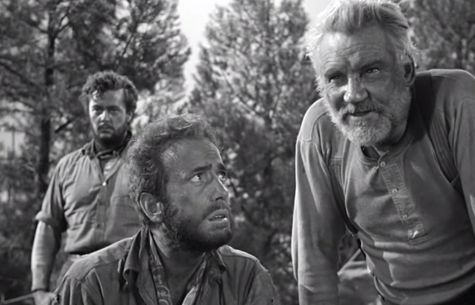 If there’s anything to take away from The Treasure of the Sierra Madre it’s that wealth never satisfies, it only serves to compound our anxieties. John Huston’s film is without question an American classic pure and simple, and it maintains that distinction because it has lost very little of its power to this day. Huston returned from shooting WWII documentaries with this project waiting for him back home. He partnered once more with Humphrey Bogart, and he even cast his father in a role that proved to be the standout in the film. Also, he shot most of Sierra Madre actually on location in Mexico, while also hiring locals as extras. It adds to the gritty realism and it was a trend that was slowly becoming more popular. His prospecting adventure film with shades of western or even noir follows three men who join forces to prospect for gold in the mountains. They first cross paths in the town of Tampico where they’re strapped for cash and barely scraping even. Fred Dobbs meets Bob Curtin (Tim Holt), who shares a similar predicament and they stick together. Upon hearing the tempting tales of gold and riches from a loquacious old prospector (Walter Huston), he plants an idea in their mind. And with nothing to lose the three partners embark on this grand undertaking. Humphrey Bogart is undoubtedly our main protagonist. In fact, he had been playing them ever since dropping the supporting roles and donning the fedora of Sam Spade in The Maltese Falcon (his first collaboration with John Huston). But down-on-his-luck, scraggly-faced Fred C. Dobbs is probably one of Bogey’s greatest performances. He’s a sourpuss and a bum, who’s begging for money and telling the local kids pestering him to beat it. These early sequences include a cameo from the director and young Robert Blake. I can also debunk a myth by confirming that Ann Sheridan is not the eye-catching woman walking down the street early on, at least not in this cut of the film. These early moments set Bogart up in such a way that we feel pity for him, even if we are not completely sold on his moral character. Tim Holt’s Curtin likewise is a sorry fellow, and he’s far more understated which makes us want him to see success. Walter Huston steals his scenes because he fits his part so beautifully. He talks and talks and talks. Laughs, gives sage advice every once in awhile, and does a jig if he feels like it. He’s a completely free-spirit, comfortable in his years, and perhaps a little less invested than the other two. He’s in for the gold, but he realizes the transience of life. Their journey is plagued by harsh terrain, heat, banditos, and even a nosy fortune hunter from Texas named Cody. But Howard’s premonitions were right and they begin raking in a mother lode. It’s hard work, but it’s coming slowly but surely. This is the key turning point in the film and the keystone to Bogart’s whole performance. And so it does. Dobbs is the perfect embodiment of what avarice does to a man. The paranoia builds up. Friends become foes, everyone is out to get him, and Reason no longer has any presence in his life. First, he wants to turn on Cody, who by all accounts wasn’t a bad fellow. Next, it’s Howard and then Curtin, who once was his closest companion. By the end of the film, “Dobbsie” has been so totally wrecked by greed, he no longer is the same person. In fact, Bogart has a simila r trajectory to Gollum except he is not redeemed. The implications here are not simply some conclusion on wealth and gold, but more importantly what it does to the hearts and minds of men. 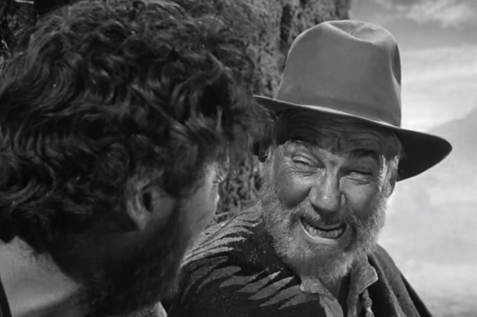 However, with all the darkness and corruption pulsing through Sierra Madre, there also are some comedic undertones mostly delivered by Walter Huston. In a sense he was the mediator between Curtin and Dobbs, keeping things civil and so when he left them, they were left to their own devices. He also is the one who is able to look at the cruel hand that they are ultimately dealt and laugh it off. Thus, Bogart gave a wholly aberrant performance, Tim Holt was more morally steadfast, and Huston was the standout with his lively turn. Humor and treachery make strange, but thoroughly entertaining bedfellows indeed. 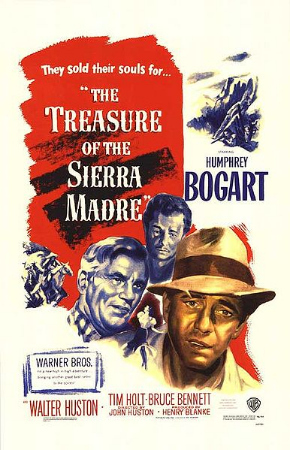 Putting Humphrey Bogart in his element once again, The Treasure of The Sierra Madre is another wonderful adventure film. Directed by John Huston, it tells the story of three men who join together in their search for an elusive treasure in Mexico. At the beginning, they are in good spirits eager to become wealthy. However, when they finally strike it rich they find it is not all it is cracked up to be . The situation escalates and they become paranoid of each other. Finally, Bogart’s character Dobbs is pushed over the edge and commits a malicious act out of desperation. Seemingly as an act of karma, he meets with another form of justice. However, it seems that by the end no one actually wins. A surprisingly good film, Sierra Madre takes your usual treasure hunt and realistically depicts man’s greed which often can overpower everything else. Bogart was supported nicely by Walter Huston (the father of the director) and Tim Holt. 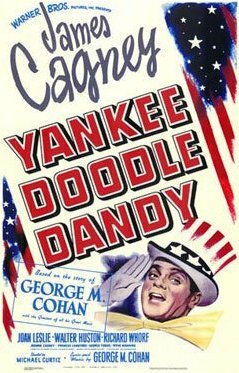 Starring James Cagney and an array of others, the film tells the real life story of writer, singer, and dancer George M. Cohan. The story begins with an older Cohan recounting his life story. He began his career with his family in Vaudeville. Slowly he made a name for himself in Broadway and married his love. He and his partner kept making musicals and then the Cohans reunited for one last show. Eventually everyone in the family settled down before they died. The only one left was George who was living with his wife. In his final performance, Cohan gets the country to rally around the flag again as he has done his whole life. This movie has many commendable moments but there is an apparent conflict between biography and musical. Cagney for his part gives a stellar performance as the energetic and ambitious Cohan. The film also doubled as a nice piece of propaganda during World War II.